Queen, the British rock band that changed the music history. Legendary, revolutionary, inspirational, these four musicians have proved that music is for everyone. But does the new biographical movie Bohemian Rhapsody succeed in showing that? Bohemian Rhapsody came out on November 2 and it immediately achieved great success, raking in $50 million in sales the first week. So many Queen fans were anxiously awaiting its release, but this movie is not only for the fans of a lifetime. Anyone who appreciates music would enjoy the movie. In general, the movie shows the beginning of the rock band, their path to success, their problems, follows Freddie Mercury’s life, and it ends with the unforgettable Live Aid concert. From the costumes to the Live Aid concert everything looks exactly the same thanks to the producers, stylists, but also Roger Taylor and Brian May who even helped in directing. However, this would not be possible without the amazing and unbelievable job of the actors. In the main role, as Freddie Mercury, is Rami Malek who, in my opinion, embraced Freddie’s image, attitude, and ‘habits’ perfectly. He learned how to walk like him, how to even talk like him. He even had the famous teeth! Rami Malek does a great job in showing us the difficulties that Mercury had, all the insecurities, but also his musical genius. Malek’s job being Mercury was great but a legend like Freddie couldn’t be impersonated perfectly by anyone because of his qualities. Malek warned the producers of the movie that he can’t sing or dance, but they still trusted him and hired him, and he did an amazing job. He learned how to dance like him and they used Freddie’s voice for the singing parts. In the role of Roger Taylor is Ben Hardy. In the role of the guitarist Brian May is Gwilym Lee, and Joe Mazzello gets in the role of the bass player John Deacon. It is hard to understand and get into the the lives of such influential and popular people because they have so many fans. The actors had the difficult job to actually realise why their roles had to do certain things, their emotions, what even made them to create music. An interesting fact is that the first filming day was actually the Live Aid concert. This was frightening for the actors, because they weren’t yet used to their roles but also because none of them are professional musicians. Additionally, they had to imagine the audience and the stadium, but when you watch it, you are going to be able to feel the emotions as if you are on stage with them. One of the most impressive scenes is when Malek, in the role of Mercury, sings one of their most famous songs- ‘Somebody to Love’, ‘Keep Yourself Alive’, etc. and plays the piano lying upside and backwards. However, my favorite scene is actually the recording of ‘Bohemian Rhapsody’. It makes you feel like you’re part of the band, as if you were there, recording with them. It shows how creative they were, especially Freddie, who changed the standards for music with this song. The movie succeeds in bringing a variety of emotions to the audience. Even i cried for the last 30 minutes. You wouldn’t be sorry if you go and see it, because it shows so many different things. 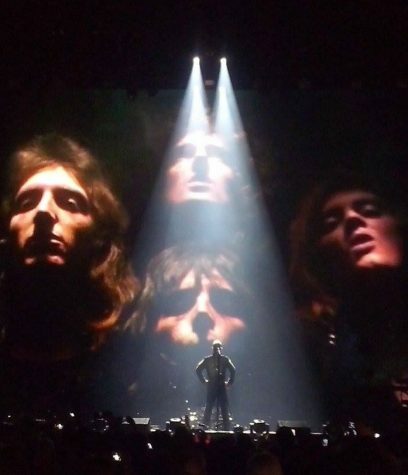 Even if you are not a Queen fan, you would be able to feel the emotions and enjoy it. I absolutely recommend it!